New World Library, 9781930722507, 165pp. Homosexuality has been politicized. But when the issue hits home, whether it involves a family member, colleague, or neighbor who's gay, all that controversy fades in the face of a real, live person who wants and deserves basic human rights and freedoms. 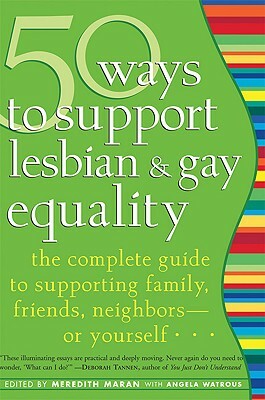 Written by gay, lesbian, bisexual, and transgendered people and those who care about them, 50 Ways to Support Lesbian and Gay Equality is a compendium of informative, joyful, and poignant essays by well-known experts, activists, and leaders, each promoting understanding while suggesting simple actions. From defining terminology ("What's gay baiting? "), to exploring family issues ("How can I support a lesbian couple who want to have children? "), the book deftly navigates workplace, cultural, and political issues. This timely and much-needed guide demonstrates positive ways to deal with everyday homophobia and heterosexism, or just plain uncertainty at the unfamiliar, offering guidance on issues ranging from the personal what to say to a closeted friend to the political how to support gay rights around the world.